The first trailer of the upcoming film, Student of the Year 2, will be released tomorrow. Before that, the filmmakers are making sure to create enough buzz about it. First being, the new poster of the film featuring Tiger Shroff. SOTY 2 is the sequel to the 2012 film, Student of the Year, which was directed by Karan Johar. The premise centred on a school competition which was a blend of academics and athletics. The second movie in the series will also focus on the same, it seems. 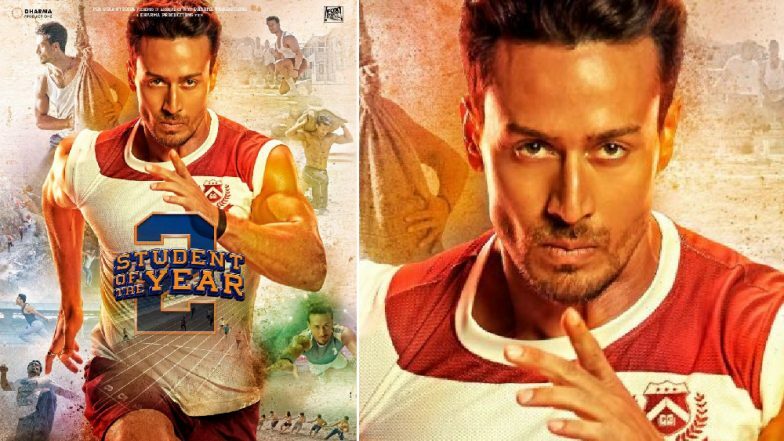 On the new poster, we see Tiger taking part in various sports and physical activities. Get ready to see more of the actor's buff bod on the big screen with the movie. Student of the Year 2 has been directed by Punit Malhotra, who has helmed movies like I Hate Luv Storys and Gore Tere Pyaar Mein in the past for Dharma Productions. While the 2012 film worked as the launch pad for Varun Dhawan, Alia Bhatt and Sidharth Malhotra, the new movie will be the debut vehicle for Tara Sutaria and Ananya Pandey. The two new actresses also shared the Tiger-centric posters on their Instagram pages. Tiger's name in the movie is revealed to be Rohan. Ananya writes, "Shoot him down but he won't fall,"
Will Smith has shot for a special song for Student of the Year 2 as part of his bucket list. We are also looking forward to watching this song in the new film. It has been reported that the old students Alia, Sid and Varun will make cameo appearances in the movie. Honestly, the new poster of Student of the Year 2 looks basic. But we are hoping there is brand new masala for us in store when the trailer comes out in the next 24 hours. Because the first film was anything but basic. As a matter of fact, that 2012 movie could have used being basic to its own advantage. Because a middle-class kid wearing the flashiest clothes just didn't settle well in the stomach.